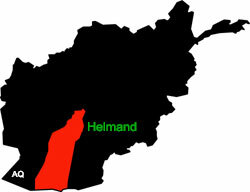 Tolo News: Officials of the Helmand provincial council and a senator in the Meshrano Jirga (Upper House of Parliament) said Sunday that the fighting in Helmand has temporarily decreased because Taliban fighters are too busy producing and smuggling drugs in the province. The officials said it was now the time for stepped-up action by security forces against the Taliban. They complained that security forces were not being pro-active and were only taking action when attacked by the insurgents. Click here to read more (external link).